Having a dog while having kids can be a great way to keep your family safe while giving your child a constant playmate, but it's also extremely important that you teach your child the proper way to live with dogs so that they don't hurt themselves or your pet. In order to ensure that your child and your dog get along, it's important you teach your child the following things about your dog. Secrets To Dog Training: Stop Your Dog's Behaviour Problems! - Click Here! It doesn't matter what your child wants to do, you need to teach your child to ask first before doing anything with the pet dog. Teach your child to ask before feeding the dog. Teach your child to ask before petting dogs he or she doesn't know. When you teach your child to ask first, you can be sure that they will always interact with your dog in a way that is safe and acceptable. Dogs have feelings too, and if your child is too rough with your dog, it could end up putting your child in danger. Make sure that you teach your child the proper way to pet a dog. You also need to make sure that your child never pulls on your dog's tail, never pokes him or her in the face, and never hits, kicks or jumps on top of your dog. The nicer and gentler your child is with your dog, the better it will be for everyone. Even if your pet dog is not aggressive, he or she may be possessive over his or her food, which is why you need to make sure your child never bothers your dog while he or she eats. Make sure your child never pets or touches your dog while they're eating, and make sure your child never puts his or her hands in your dogs food bowl while they're eating either. This is the best way to avoid injury. Pets can become startled, and if your child tries to pet the dog when he or she is sleeping, your dog could become startled and harm your child. Make sure your child only plays with the dog when he or she is awake and understands what is going on. You don't want your child to become hurt, and teaching them to avoid startling your dog is important. Younger dogs are very energetic, and older dogs may be more irritable. Only you truly understand your dog's demeanor and personality, so make sure your child understands this as well. For example, if you have an untrained puppy, teach your child that the puppy is going to run around, jump and be excited. If you have an older dog, teach your child that he or she is not going to want to run and jump and play as often. This way, your child will know what exactly to expect of your pup. 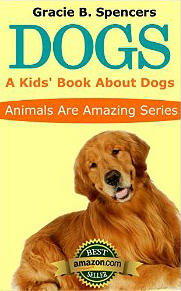 This best selling, non-fiction book about dogs is filled with many interesting and unique facts, along with wonderful images that will delight children and dog lovers of all ages. Dogs are one of the best-loved animals in the world, as well as being one of the most popular pets. In this kids’ book about dogs, children will discover lots of new and fascinating information about them. If you are looking for a book that goes beyond the basics, “Dogs: A Kids Book About Dogs” is for you.